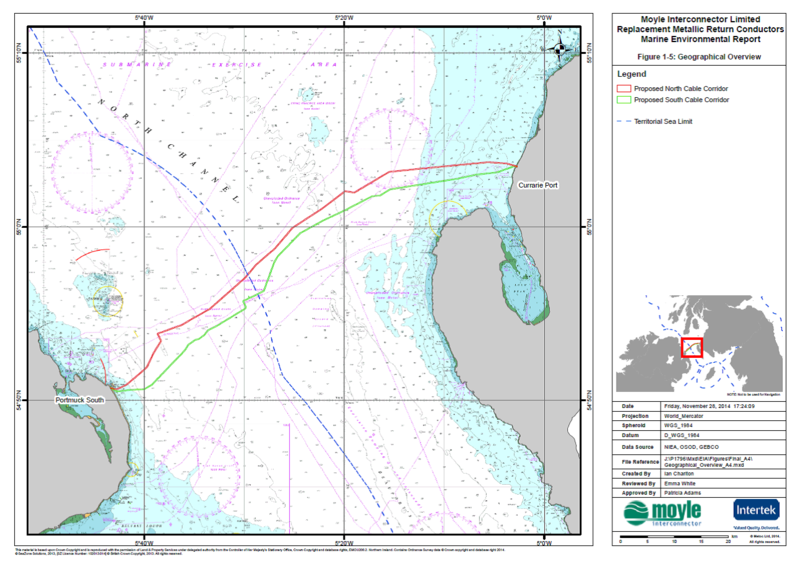 This is an update on progress with the installation of the Moyle Returns Cables in the North Channel of the Irish Sea. A Notice to Mariners has previously been issued for this work, detailing the route and construction schedule. A revised Notice to Mariners can be downloaded here, giving up-to-date details on project progress and plans. A brief update on progress to date is provided below. Cable installation work on the first (northern) cable was completed between August and September 2015. Rock protection work is due to be carried out at points along the northern cable route where cable burial has not been possible. This work is due to be carried out by the fallpipe vessel Rockpiper between 18th-29th October 2015 (weather and conditions permitting). Cable burial and protection work will also be carried out by Nexans Skagerrak and is due to start on the 20th October 2015. The cable will be buried wherever possible, and protected with rock where burial is not possible. Cable burial work on the south cable is due to be completed by the 1st December 2015 (weather and conditions permitting). Rock protection placement from the fall-pipe vessel Rockpiper is due to take place along parts of the route of this cable in the North Channel between the 1st December and 1st January 2016 (again, weather permitting). Nearshore, shallow water rock protection is now scheduled for March 2016. During cable laying and rock protection operations the vessels will be restricted in the ability to manoeuvre, and other vessels are asked to give a wide berth.